So the dog days of summer are here and things are hot at the Newhill Garage. Unfortunately, hot only means that the work accomplished slows down and the sweat produced increases. I try to get any outdoor work done well before noon because by mid-afternoon the heat is brutal! Things are a little better in the shop, if the air conditioner is running full blast and I can keep the doors closed. Still, it can get toasty. Last month I had opened up a gaping hole in the passenger side floor area. 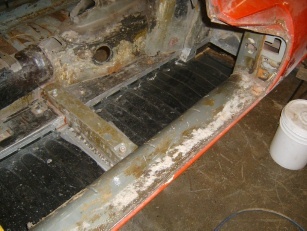 I had purchased replacement sheet metal for the floor area from Martin Robey in the UK via Terry’s Jaguar in Illinois. Buying parts is so easy. The tough part is getting them installed! So here we go. Just like snowflakes, no two E-Types are exactly the same and as a consequence, the replacement sheet metal just gets you close. Some tweaking is required. What tweaking may be required will vary, just don’t be surprised that it will be required. I laid in the new floor pan into the prepared opening and got down to work. The attachment at the rear is more convoluted than along the sides and the front so I concentrated on that part first. First efforts were held in place with clamps. Go down to Harbour Freight and buy several dozen vice grip type clamps of various sizes. 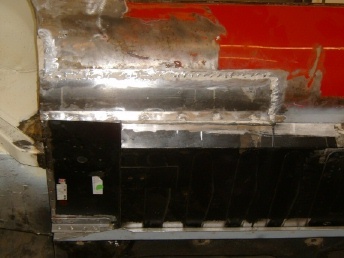 They don’t need to be of high quality, they just need to hold things in place until the welding can commence. Several nips and tucks were required before I got to the point where the first tack welds could be laid in. As discussed in previous articles, start with widely spaced tack welds, to avoid warping due to the heat and to make sure that all sides are going to fit. Then fill in with additional welds closer together. I have had consistent problems with getting the welds to “stick”. The new sheet metal welds very well but the 40 year old sheet metal doesn’t always want to cooperate. I have asked around about this phenomena and as best as I can tell, the problem is contamination of the old metal, either due to rust or other contaminants such as grease and oil. Another problem is the lead solder used at the factory to fill in seams. I work the area to be welded with a sanding disk to get the metal as bright as possible but there are still points that won’t weld in an acceptable fashion. Maybe with more experience my results will be more reliable but I have come to expect that I won’t be able to get the seam welded reliably along 100% of its length. My personal solution is to take what I get and fill in the remainder with epoxy putty. Remember, the original joint was only spot welded on a 1″ to 2″ spacing so structurally speaking, a continuous weld is not required. Water intrusion is another concern and I feel that the epoxy putty seals the seam quite well. The traditional Detroit product for seams is a goop call Seam Sealer. I bought some and found it to be messy and not very aesthetic. Conversely, the epoxy putty can be sanded down to a very presentable profile. I buy my putty from the firm that markets POR-15 although I’m sure there are many acceptable equivalent products. Regardless, this is my solution to obtaining those smooth weld joints that will look good for years to come. So the floor was laid in and welded around it perimeter. A great feeling of accomplishment wells up as I could see a great void filled with many square feet of sold sheet metal. Following this major replacement of the bad metal with the good were many hours of fiddly bits as I dealt with smaller areas of corrosion. I won’t go into the gory details but suffice it say that many smaller patch panels were required to get rid of all the areas along the passenger side that were in need of new steel to replace the rot. Finally I “turned the corner” and got to work on the drivers side. The floor board effort on the drivers side was similar to that on the passenger side. The damage to the sills was a little worse on the drivers side, maybe due to a lifetime of wet shoes transferring their moisture to the carpet. 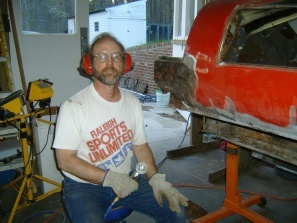 One area that I found to be especially challenging was the repair to the wheel well lip at the rear fender wells. Both sides of the car were well corroded. 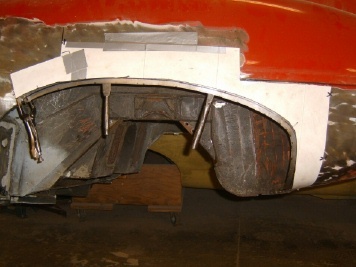 The E-Type is especially challenging since the wheel well has both an inner and outer panel. The first step it to create a pattern or template. Find a large piece of single ply (not corrugated) card stock. Lay it on the fender opening and trace around the wheel well lip from the back side onto the card stock. Be sure to add some match marks between the edge of the card stock and the body so the card stock can be taken off and then put back in the same place. Once you cut away the rusted material, this pattern will be the only record you have of the original profile. The wheel well is a 3 dimensional curve and thus quite a challenge to hand fabricate. Part of the problem is that the 2 dimensional curve has a lip bent at right angles, to provide stiffness. This really makes the problem quite a bit more complex. You will have to be able to shrink and stretch the metal to get things into the proper shape. Martin Thaddeus describes this in his book but plan on destroying some practice pieces before you can hope to begin to get the hang of it. For my first effort I cut out a “buck” out of oak flooring material that I could work the material against. This actually worked pretty well, once the pattern was made, as I could pound the sheet metal against the wood pattern and coerce it into shape. For the opposite side I got bold and worked without a buck and instead worked freehand. The results were not too bad but no one will mistake my part for a factory stamped panel. The shrinking part in particular is still not quite working for me but I am getting close. As I mentioned, there is an inner panel and an outer panel. The good news is you get to practice on the inner panel, as it is generally hid from view after the installation is complete. The outer panel is of course in plain sight and needs to be brought in pretty close to its final form. Of course a small amount of plastic body filler will be your friend in getting the final profile just right. Just remember, sheet metal is cheap and your time is free so go for it. The satisfaction when you finally get it right is truly gratifying. Next month, we’ll finish welding in sheet metal and get started applying final paint (!!!) to the underside of the car.